What is that?? Does seeing a salad here blow your mind just a little? Would you be surprised if I told you that I love veggies even more than sweets? My head is positively spinning seeing all things green popping up at the farmers’ market. I am snapping up asparagus while I can, and this raw salad is my favorite new thing to do with it. I know that raw asparagus sounds a little strange, but I have been eating up huge bowlfuls of this stuff all month long. 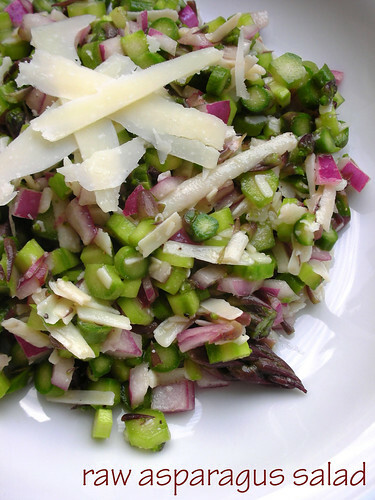 Take those skinny-minny stalks of raw asparagus, add red onion, sharp pecorino and a quick dressing and you get something super fresh, crisp, and snappy. Not to mention so easy…my only real advice is to use a big cutting board for prep, because otherwise those little coins of asparagus will want to go mobile all over your counter. -Cut the asparagus, including the tips into very thin slices, crosswise and place in a medium bowl. Add the red onion and pecorino and toss to combine. 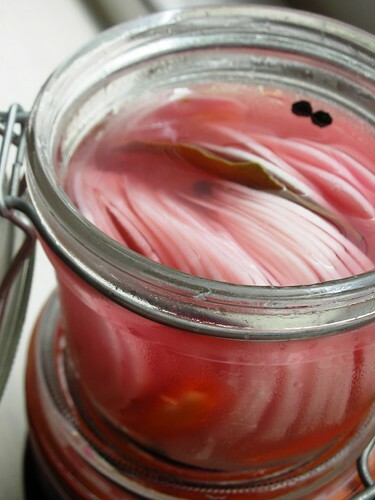 -Dress with the vinegar, olive oil and salt and toss again. This salad should be fairly heavily dressed. The vinegar will sort of “cook” or tenderize the asparagus. It is best to do this about an hour or so in advance to let the flavors marry. Courtney of Coco Cooks and Linda of make life sweeter! 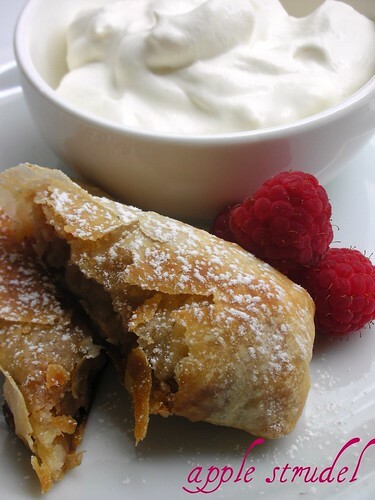 picked a fantastic Daring Bakers’ challenge this month– strudel! Just thinking about strudel makes me long to re-visit Vienna and Budapest, cities that I travelled to long ago. At just nineteen, it was too bad I didn’t know then what I know now about pastries. Actually, maybe it was a good thing– I would never have seen the sights because I would have been sitting in coffee houses all day long! Prior to this, the only time I’ve made true strudel dough was while studying at the FCI. I vividly remember my partner in strudel-making crime, S, and I struggling with a huge ball of dough, stretching it gently over our hands to eventually cover our entire worktable. I also vividly remember that taking more patience and concentration than I’m normally willing to put in, so whenever I’ve made strudel at home, I’ve gone the lazy route and used store-bought phyllo instead! My dessert schedule is rather full on at the moment, so I thought something savory would be the smartest way to get this challenge done. Mushrooms immediately came to mind as a tasty strudel filling, and here I used a combination of crimini, shitake and trumpet. I sautéed them first, mainly so I knew they would be cooked through and seasoned properly, but also to release their liquid so the pastry wouldn’t turn soggy. Caramelized onions, garlic, pine nuts and goat cheese all sounded like good things to add to ‘shrooms, and went into the mix. I have to say that I just winged my filling measurement-wise, and was quite please to have a bit left-over…it will make tomorrow morning’s omelette that much better. There are only two of us here at home, so I just made a half-recipe of the dough. It was a really easy amount to deal with, and I stretched it solo on a clean tea towel with no problems at all– very little patience and concentration required, thank you! My strudel-for-two was a cinch to fill and transfer as well. 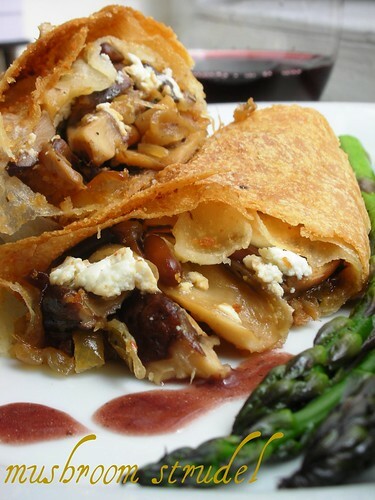 The mushrooms and goat cheese made a wonderful, hearty filling…perfect for a cool spring day like today. A glass of red wine and some asparagus on the side…much to R’s dismay, I was belting out “I am Sixteen Going on Seventeen” at the dinner table (OK, so that was probably just the wine)! I had only planned to make the mushroom strudel, but I had the teensiest bit of dough left after rolling it, so I made a couple of two-bite apple strudels as well. Since they were so small, to make the filling, I just grated half an apple, squeezed most of the liquid out, and tossed it with dark brown sugar, cinnamon and chopped pecans. And the only way to eat apple strudel? Mit schlag, of course! 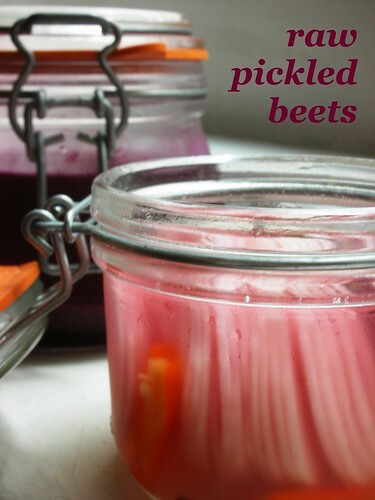 This was a really fun recipe to make, and it’s very adaptable. 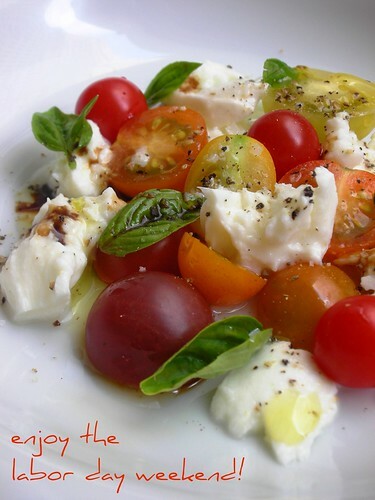 Sweet and savory possibilities are limitless, although I’m sure you’ll find heaps of inspiration on the Daring Kitchen site. I’m listing the recipe for the dough below, but you can find more information on Coco Cooks and make life sweeter! -Combine the flour and salt in a stand-mixer fitted with the paddle attachment. Mix the water, oil and vinegar in a measuring cup. Add the water/oil mixture to the flour with the mixer on low speed. You will get a soft dough. Make sure it is not too dry, add a little more water if necessary. Take the dough out of the mixer. Change to the dough hook. Put the dough ball back in the mixer. Let the dough knead on medium until you get a soft dough ball with a somewhat rough surface. -Take the dough out of the mixer and continue kneading by hand on an unfloured work surface. Knead for about 2 minutes. Pick up the dough and throw it down hard onto your working surface occasionally. Shape the dough into a ball and transfer it to a plate. Oil the top of the dough ball lightly. Cover the ball tightly with plastic wrap. Allow to stand for 30-90 minutes (longer is better). -It would be best if you have a work area that you can walk around on all sides like a 36 inch (90 cm) round table or a work surface of 23 x 38 inches (60 x 100 cm). Cover your working area with table cloth, dust it with flour and rub it into the fabric. Put your dough ball in the middle and roll it out as much as you can. Pick the dough up by holding it by an edge. This way the weight of the dough and gravity can help stretching it as it hangs. Using the back of your hands to gently stretch and pull the dough. You can use your forearms to support it. -The dough will become too large to hold. Put it on your work surface. Leave the thicker edge of the dough to hang over the edge of the table. Place your hands underneath the dough and stretch and pull the dough thinner using the backs of your hands. Stretch and pull the dough until it’s about 2 feet (60 cm) wide and 3 feet (90 cm) long, it will be tissue-thin by this time. Cut away the thick dough around the edges with scissors. The dough is now ready to be filled. -Put the rack in the upper third of the oven and preheat the oven to 400°F (200°C). Line a large baking sheet with baking paper (parchment paper). Spread about 3 tablespoons of the melted butter over the dough using your hands (a bristle brush could tear the dough, you could use a special feather pastry brush instead of your hands). Sprinkle the buttered dough with the bread crumbs. Spread your filling about 3 inches (8 cm) from the short edge of the dough in a 6-inch-(15cm)-wide strip. -Fold the short end of the dough onto the filling. Lift the tablecloth at the short end of the dough so that the strudel rolls onto itself. Transfer the strudel to the prepared baking sheet by lifting it. Curve it into a horseshoe to fit, if necessary. Tuck the ends under the strudel. Brush the top with the remaining melted butter. -Bake the strudel for about 30 minutes or until it is deep golden brown. Cool for at least 30 minutes before slicing. Use a serrated knife and serve either warm or at room temperature. It is best on the day it is baked.